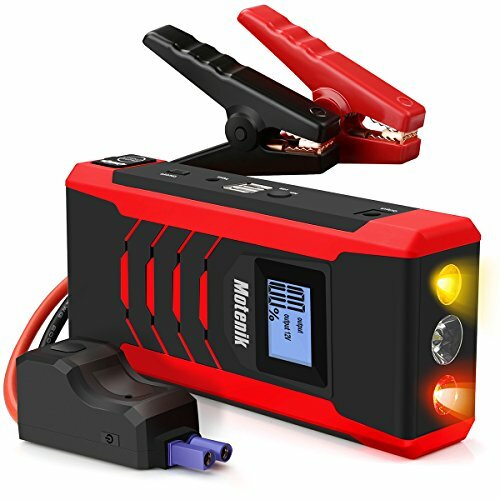 With 800A peak current and smart jump clamps, the jump starter can start vehicle up to Gas 6.5L and Diesel 5.0L. 35 times for 1.8L Gas on one single charge. There are three LED lights for outdoor adventure and emergency warning.The main light has three modes:SOS/IlluminatioN/Strobe.The two LED lights on the side are designed for emergency warning,which will blink in red and yellow. 15000mAh battery pack with dual USB ports powers your devices with output up to 2.1A,which is faster than the ordinary power bank on the market. Built-in safeguard systems to protect you from any power surges,short circuits,reverse polarity and more.The reinforced jump clamps is made of high-strength material,no more craking. Press the power button to select the output voltage.The bright LED screen exactly shows the remaining power and output voltage,which will help you make better use of the power. 1.Please read the user manual carefully before using. 2.Please allow the jump starter to cool down for 15s or 2 minutes(if beep) after each start attempt. 3.Don't attempt to jump start any engine that exceeds the maximum displacement the charging unit can bear, or it will cause serious damage to the jump start unit. 4.For a better using experience,please make sure the charge is no less than 30% before every start attempt. 【Car Life Saver】Jump starter starts your vehicles(up to 6.5L Gas or 5.0L Diesel Engines) with 800amp of peak current like Car,Motorcycle, Lawn Mower,Snowmobiles,Yacht,etc. Up to 35 times on one single charge for 1.8L Gas car. 【4 Modes Flashlight】Main light has three modes:Illumination/Strobe/SOS.Two small light on the side can work as Emergency Warning Light,which will flash alternately in Red & Yellow.Must-have item for outdoor adventures and emergency use. 【Smart Jump Clamps】The jump clamp features more than 8 advanced safety technology including Reverse charge protection,Short circuit protection,Over temperature protection,Reverse polarity protection,Over discharge protection,Over charge protection,Reverse connection protection,Over current protection.With harsh quality check, never worry about cracking or catching on fire. 【Power Bank with Dual USB Ports】15000mAh Jump starter is equipped with two USB ports, which can charge two devices simultaneously for many times.The output power is up to 10W(5V/2A). 【Lifetime Support Guaranteed】Your satisfaction is our wish, we zealously provide the highest quality service for you! 45 days money back & One year exchange guaranteed(non-human). Questions will be respond within 24 hours. If you have any questions about this product by Motenik, contact us by completing and submitting the form below. If you are looking for a specif part number, please include it with your message.